For now, this show is safe in their cozy watch-y space, and you can gather there tonight to see jokes aplenty from Josh Sharp, Sally Burtnick, Nikki Black, Ben Kling, LeClerc Andre, Luke Mones, Eudora Peterson, Diego Lopez, and surely some bits here and there from your hosts. I’ve attended Future Forms only once, but it managed to be one of the wildest, most creative, and funniest comedy shows I’d been at in a while. If you’d like to smile through the tears of the last days of 2016, get thee to a watchery. Some people imagine music in the air when they’re with their loved one, but this show could make it a reality. 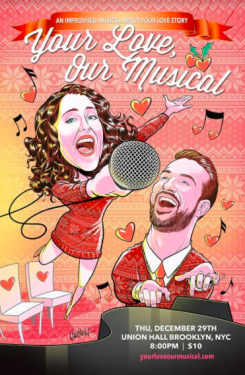 Musical improvisers Evan Kaufman and Rebecca Vigil’s “interactive, immersive theater experience” Your Love, Our Musical is pretty much exactly what the title says. The two performers will select a couple from the audience, hear their story, and create a musical about it, right there in the room. This could either be incredibly ego-boosting or incredibly embarrassing; I suppose it depends on how the two lovebirds came to be. But with accolades from Time Out NY and The New York Times, it seems to be filling everyone with love. Perhaps it could even warm the heart of the most jaded millenial. It’s winter, so that’ll be extra tough. Murder isn’t funny. Murder mysteries, on the other hand, are ripe for the jokin’. They bring to mind those weird parties people supposedly had in their youth, rife with melodrama and layered dresses. At least that’s what I imagine they were like. Also, Clue. Everyone loves Clue. With sketch group Deathbird’s show, you needn’t imagine. It’s right there in front of you. Murder mystery, that is. HINT is a half-hour show (gotta love efficiency) throwing six characters into a scenario where they must all figure out the classic “whodunnit.” It previously played to sold-out houses at The PIT Loft, and is now moving to the nearby UCB Chelsea for even more murder and mystery. Plus, the audience chooses the killer each time, so if you like it so much you wanna come back, it won’t even be the same. It’ll be… a mystery. As we’ve learned this week, Judson church is a pretty swell place with a pretty important history. They’re an actual church, they’re socially-conscious, they provide a home for the arts, and they even helped women get abortions when the laws turned against them. 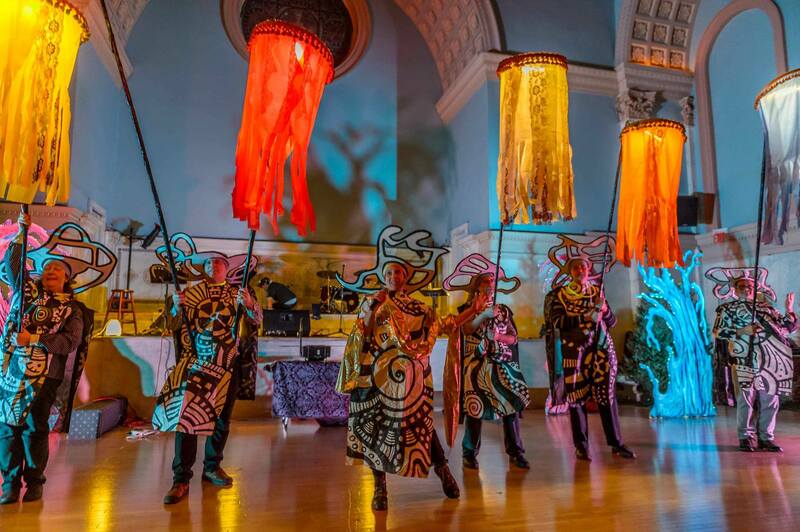 On the eve of New Year’s Eve, the space will welcome a generous helping of both art and pasta with the Great Small Works Spaghetti Dinner, an evening of noodles, puppetry, costume and prop creations, music, and more. Though spaghetti’s nothing fancy, the musical stylings will certainly be unique and diverse, with “liturgical polyphonic singing from the Republic of Georgia,” an “interactive, improvisational vocal performance,” and tunes by SHARABI, billed as “the world’s first Yiddish-Punjabi-bhangra-funk-klezmer party band.” Get ready to twirl your fork and your hips. 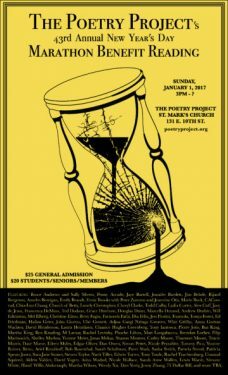 Sunday, January 1 at The Poetry Project in St Mark’s Church, 3 pm: $25 general, $20 students/seniors. Anything artsy that has stuck around in the city for 43 years is worth celebrating, and The Poetry Project is no exception. They’re ringing in 2017 with their annual fundraiser reading marathon, one that begins at 3 pm and ends at question mark o’clock. The jam-packed day will feature readings from folks like Penny Arcade, Justin Vivian Bond, Grace Dunham, Edgar Oliver, Rachel Trachtenburg, Jenny Zhang, Eileen Myles, and more. Support the arts and surround yourself with some seriously cool people. 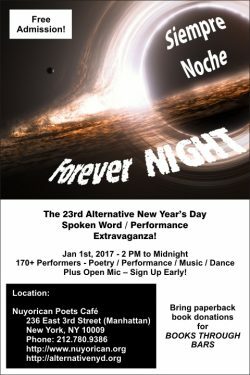 If you thought the first day of the new year was only going to have one marathon spoken word event, you were wrong. There’s this one, too, and it’s in its 23rd year. These marathon readers really know how to stick around. From 2 pm until midnight, you can hear the work of over 160 performers like Ava Chin, Lydia Cortes, Anne Waldman, and more. Plus, if you fancy yourself a wordsmith, there will be recurring slots throughout the day where you can get up there and speak your mind. The event will be taking book donations for Books Through Bars, if you’d like to do a little good while attending a free all-day event.